The use of video intercom systems for security applications are only just beginning to be explored. While the technology has existed for years, because most video intercom systems were designed with residential applications in mind, it has only been recently that networked solutions have provided real and tangible benefits for security systems administrators. Networked video intercoms have the capacity to provide huge benefits to security systems so long as they are implemented and integrated intelligently. Learn more about the benefits of video intercom systems, below. 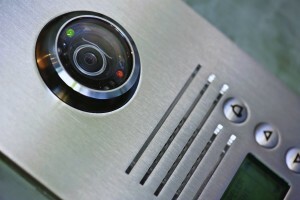 Video intercoms provide many benefits in security applications. Image usability is key in security applications, as there is no point in capturing an image that cannot be used to reliably identify a subject or accurately gauge a situation. Video intercom technology is evolving to include cameras with the capability to capture superior images even in low-light or heavily backlit situations, offering reliable and clear images. Video intercom systems are often required in high-traffic areas, and in order to ensure functional awareness, sound quality is paramount. Manufacturers are beginning to recognize this importance and integrate features such as noise reduction and wind protected microphones to ensure usability. Whereas residential video intercoms can be standalone systems, in security applications the ability to integrate with other security systems is incredibly important. IP video intercoms can be connected to access control, communication and alarm systems, and other aspects of video surveillance systems to provide holistic situational awareness. The addition of analytics makes video intercom systems even more effective by allowing them to detect emergency situations by registering the sound of a gunshot or broken glass and immediately sounding an alarm or sending a message to a security administrator. This entry was posted on Thursday, February 4th, 2016 at 1:56 pm. Both comments and pings are currently closed.